Ten-man Sunderland recorded their first league win of the season as Jermain Defoe's second-half penalty handed them victory against Bournemouth. It was a remarkable result for the Black Cats, who continually soaked up pressure from their opponents and found themselves a man down when Steven Pienaar was sent off in the 59th minute. The Cherries took an 11th-minute lead when Dan Gosling converted Adam Smith's cross from close range for his third goal of the season. The Black Cats lost 4-1 at home to Arsenal last week and once again looked vulnerable at the back, with Junior Stanislas and Joshua King both going close after the opener. But they surprisingly drew level in the 33rd minute when Victor Anichebe smacked his six-yard shot high past the reach of keeper Artur Boruc. Sunderland began the second half well but were dealt a huge blow when Pienaar was shown a second yellow card for a late challenge on Stanislas. Despite being a man down, David Moyes' side still pressed and were rewarded with a spot-kick when Anichebe was fouled by Adam Smith in the area. Defoe converted against his former team as his current side hung on for a morale-boosting win. This match looked like a home-win banker, more so after Gosling used his stomach to give Eddie Howe's side the lead. The visitors' defence, which had conceded three against Everton and Palace and four against the Gunners, looked set for another uncomfortable day. Moyes started with a 4-4-2 formation, but changed to 4-5-1 after going behind to stem the flow of Bournemouth's attacks from the wings. It worked and gave Sunderland the chance to focus on troubling the home side. The change in tactic paid off as Defoe, playing deeper, fed Anichebe in the area. The striker used his 6ft 3in physique to hold off his marker, turn and then crack a shot past Pickford to equalise. That was the former Everton player's first Premier League goal since scoring for West Brom against Newcastle in May 2015 - 546 days ago. Moyes - watching from the stands as he served a suspension - must have thought the footballing gods were not on his side when Pienaar was deservedly sent off with 31 minutes remaining. But the spirit that had drawn Sunderland level was again present when they drove forward and Anichebe, once again tussling in the area, fell under the challenge of Smith. Some might have deemed it a weak challenge but Mike Dean pointed to the spot and Defoe dispatched the ball high into Boruc's net. How did Bournemouth manage to lose? The Cherries had only lost one game at home this season and it appeared highly unlikely that Saturday's contest would result in a second, as they fired in 22 shots and enjoyed 70% of possession. But they found Sunderland keeper Jordan Pickford, 22, in exceptional form. The England Under-21 keeper made great saves to deny Jack Wilshere and Joshua King. Junior Stanislas also saw a sidefoot shot come off the post and substitute striker Benik Afobe, who has not scored since March, twice screwed good opportunities wide. For manager Eddie Howe it must have been a sense of déjà vu, with another North-East club, Newcastle, surviving a similar onslaught during the 2015 Guy Fawkes weekend to come away with their first win of the season. Of course, they were eventually relegated. "It was about the shift Anichebe put in," Match of the Day pundit Jermaine Jenas said. "He was playing with a cracked rib at one point so no-one can question his desire and he is just so strong. "He was a real asset for Sunderland because they were under so much pressure but he was a great focal point for them to hold up the ball." Sunderland boss David Moyes: "Anichebe was terrific today. He has an awful lot going for him and his all-round performance was terrific. He got an injury early on - he thought he broke his rib." On the second yellow card shown to Steven Pienaar: "At the time I thought there was nothing in the tackle, I thought he got the ball, but now I can see why it can be given. "It is only one win. We need two, we need to just keep picking up the points. Hopefully it will show people there is a great spirit and commitment among the players and desire to do well. "We went to a factory this week, showing the players it is much better to be a footballer than working in a factory." 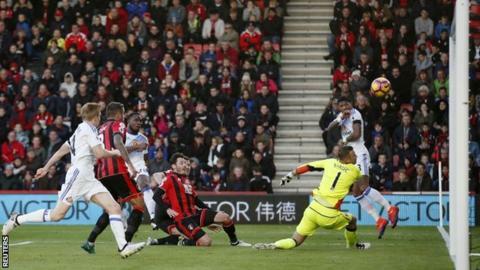 Bournemouth manager Eddie Howe: "In the last two games we've had some gilt-edged chances. We scored six against Hull, but it's frustrating when you have a hatful of chances and can't put them away. "We should have gone 2-0 ahead as we had chances in the first half which we didn't put away. You feel the red card would swing the game back in our favour, we battered their goal for the next 15 minutes and that's when we needed to find the killer touch, but we didn't. We left the back door open and conceded what was a poor goal for us." Moyes has won his first Premier League game since a victory against Newcastle in April 2014 - 945 days ago. Sunderland enjoyed their first win in their last 12 Premier League games (3-0 v Everton on May 11th 2016). Wilshere made his 100th Premier League start today, over six-and-a-half years since his first (Feb 2010 for Bolton v Man City). Smith has provided more assists this season than any other Premier League defender (3). Anichebe became only the third player to score a goal this season for Sunderland in the top-flight - also Jermain Defoe (6) and Patrick van Aanholt (2). Pienaar has been sent off four times in the Premier League, all while playing under David Moyes (3 for Everton, 1 for Sunderland). Defoe has netted 11 away goals in the Premier League in 2016, a haul bettered only by Sergio Aguero with 15 (Harry Kane also has 11). Defoe has scored against 35 of the 38 Premier League clubs he has faced. After the international break, Sunderland are at home to fellow strugglers Hull on 19 November and Bournemouth are away at Stoke on the same day. Both are 15:00 GMT kick offs. Match ends, Bournemouth 1, Sunderland 2. Second Half ends, Bournemouth 1, Sunderland 2. Attempt blocked. Lynden Gooch (Sunderland) right footed shot from the centre of the box is blocked. Assisted by Patrick van Aanholt. Jack Wilshere (Bournemouth) wins a free kick in the defensive half. Substitution, Sunderland. Lynden Gooch replaces Jermain Defoe. Attempt missed. Lys Mousset (Bournemouth) header from the centre of the box misses to the left. Assisted by Ryan Fraser with a cross following a corner. Corner, Bournemouth. Conceded by Papy Djilobodji. Attempt missed. Dan Gosling (Bournemouth) left footed shot from the centre of the box misses to the left. Assisted by Simon Francis. Attempt missed. Jack Wilshere (Bournemouth) left footed shot from outside the box is too high. Assisted by Benik Afobe. Substitution, Sunderland. Donald Love replaces Duncan Watmore. Jack Wilshere (Bournemouth) wins a free kick on the left wing. Foul by Victor Anichebe (Sunderland). Delay in match Victor Anichebe (Sunderland) because of an injury. Attempt saved. Joshua King (Bournemouth) right footed shot from the centre of the box is saved in the top centre of the goal. Assisted by Benik Afobe with a headed pass. Attempt missed. Steve Cook (Bournemouth) header from the left side of the six yard box misses to the left following a set piece situation. Foul by Duncan Watmore (Sunderland). Attempt missed. Benik Afobe (Bournemouth) left footed shot from outside the box misses to the right. Assisted by Lys Mousset. Substitution, Bournemouth. Ryan Fraser replaces Junior Stanislas. Victor Anichebe (Sunderland) wins a free kick in the defensive half. Victor Anichebe (Sunderland) wins a free kick on the left wing. Jason Denayer (Sunderland) wins a free kick in the defensive half. Patrick van Aanholt (Sunderland) wins a free kick on the left wing. Substitution, Bournemouth. Lys Mousset replaces Harry Arter. Attempt missed. Benik Afobe (Bournemouth) right footed shot from the centre of the box is close, but misses to the left. Goal! Bournemouth 1, Sunderland 2. Jermain Defoe (Sunderland) converts the penalty with a right footed shot to the top right corner.